Being faced with an older companion that refuses to eat or exhibits signs of a loss of appetite can be a scary situation for dog owners. Loss of appetite in dogs is often one of the first signs that your pet is not feeling well. At some point, however, most older dogs begin to eat less. This is a natural byproduct of aging, where the dog’s intake of food reduces as their metabolism begins to slow down. That being said, some dogs simply develop a picky streak when they get older. 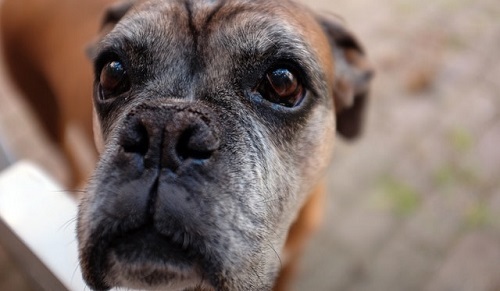 Figuring out what to feed an older dog that won’t eat can be a significant hurdle for some owners. Learning to effectively navigate your picky or undereating older pet can be difficult as established routines are upset for both the owner and pet. This article will offer some helpful tips that can be used to encourage your pet to eat more. It will also discuss why it’s important to consult with your veterinarian when you notice a significant change in eating patterns for your pet. When your dog experiences a change in eating habits, it may be an indication that there is an underlying medical condition. This is particularly true when your dog loses their appetite. A checkup with your veterinarian isn’t just a good idea because it may uncover an undiagnosed medical condition, it’s also recommended because a loss of appetite can lead to health complications in older dogs. One of the most common effects of loss of appetite is dehydration, which can lead to further health complications if left untreated. Your veterinarian will be able to check their current health and run diagnostic tests to determine if any underlying condition is at fault. Ruling this out can give a large amount of peace of mind moving forward when determining what to feed your dog. Your veterinarian will also be able to offer guidance about what to feed an older dog that may help you fix your pet’s problem. Once you have ruled out any underlying medical conditions like dog cancer or diseases and gotten some guidance from your veterinarian, it’s time to attack the problem of your picky or undereating pet. There are many reasons that dogs can begin to eat less when they get older, and in some cases, there is no single answer. As dogs get older, they may begin to change longstanding habits, develop new preferences, and otherwise manifest the aging experience in a variety of ways. As an owner, these changes in your longtime companion may seem sudden and catch you off guard. However, it is important to remember that a loss of appetite or picky eating behavior may just be a way to communicate that your dog wants you to change it up a bit. Adapting to picky eating in older dogs requires having some flexibility, and an open mindset toward finding a solution that works while also sticking with the recommended dog nutrition checklist. As such, owners will find that they may have to try a variety of different approaches to achieve an acceptable level of nutrition for their older dog. The following tips can be used as a basis for early experimentation, but your particular solution may require thinking outside of the box. Sometimes the solution is as simple as making slight adjustments to your dog’s meal time. Experiment with giving him food slightly earlier or later than you normally would. Don’t be afraid to try out different foods that you have fed him in the past. Sometimes a new formula or flavor can excite his palate and encourage him to resume eating normally. Your older dog may just be bored of the same old food he’s eaten for years. If you do change his food, select a good food source that uses high-quality ingredients and meets the nutritional needs of your dog’s age. If your dog has always eaten kibble, it may be time to try feeding him some wet food. You can try mixing some wet food into his dry food, or if he shows a liking towards this type of food, just transition him completely to the wet variety. Wet food has the added benefit of providing a higher level of moisture than dry food, which helps prevent dehydration associated with loss of appetite. Try stirring your dog’s food with a bit of warm water, or microwaving it for a few seconds to make it more appealing. This may help your dog to find some curiosity towards the food, and excite his palate enough to encourage them to begin eating. If you have followed these recommendations above and you are still having troubles getting your old dog to eat, it may be time to take your furry companion into the vet for further examination.